I got my hug. 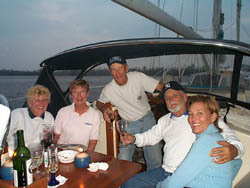 Upon returning to the boat I also welcomed the dinner invitation from Ray aboard Casa Blanca to join he and his wife along with the captain and first mate aboard Cut'em at the Coinjock Marina Restaurant. ''Sounds good, Ray. Thanks. Gwen and I will see you then.'' Jim sends Ray a wave from the cockpit before he turns to continue down the dock. Heading below, I'm surprised at Jim's ready agreement knowing his determination to realize the full potential of the cost effectiveness inherent in moving aboard the Damn Yankee. But I suppress any comment. I guess we wouldn't be eating aboard tonight. Smiling, I drop the shampoo into my shower bag pleased that replaying the day's run trumps fiscal responsibility. ''This vehicle is even more disreputable than last year,'' laughs Betty, Ray's wife as the six of us pile into the mini-van. Jim and I opt for the bench seat in the rear. We crouch and drop sinking deep to root with our knees under our chins and feet off the floor. The echo of Mary Sue's query about managing without a car flits through my mind. Jim is shifting using both hands for balance. As he moves the seat beneath me is also shifting. I grab the outer edge to keep from falling sideways. We were managing. Laughter filled the van as we all became acquainted ouncing along North Carolina's gravel roads above worn shocks. I wondered if the others could read the incredulity in my face through the darkness. Settled in the white-cedar-rustic interior of Coinjock Restaurant sipping a chardonnay, exchanging preliminary pleasantries flush with the day's accomplishment, locks and all, I caught Jim's eye and his wide grin. We'd made the right decision. Ray and Betty made our next decision recommending the roast beef. I was considering shrimp but Ray's information today had been dead on. We'd bow to his expertise. In a day filled to brimming with new experiences I'd not expected dinner to become another. The sound of wheels rolling over the wooden floor caused an abrupt abandonment of our conversation. Dinner had arrived. Sitting on individual twelve inch wood planks were the biggest cuts of roast beef I had ever seen. ''They're known here for their beef. It's very good. You'll both enjoy it.'' Betty said picking up her knife. Nonplused, as if the side of beef lying in front of her was nothing out of the ordinary, she cut into her portion and began to eat. ''Gwen and I will be eating this for a week. I can't believe it,'' Jim comments. ''Yes, we do but I wanted my own tonight.'' Betty adds. ''She who must be obeyed,'' Ray says with an arched brow and a pointed look at the plate just set in front of him. ''Sandwiches tomorrow Jimmy, and the day after.'' Alice, Cut'em's first mate announces staring at her plate. ''My God, there's half a cow here.'' She looks as surprised as I do. I notice Jimmy's ordered the fish. ''Are you sure this much red meat is good for you?'' I ask between delicious bites. Ray shrugs and reaches for his wine. ''You're the doctors.'' Jim concludes. The captains' meeting to determine the optimum window for crossing Albermarle Sound began near to seven Friday morning and ran past eight-thirty. Two pots of coffee later, the men continued to pace the docks against the blowing north wind while talking in small groups as they compared weather faxes and NOOA broadcasts. Then they would reform groups to pace and talk some more. ''Albermarle is shallow. Those winds come up causing a long fetch from all directions. It'll kick right up on you. Damned uncomfortable, I can tell you,'' declared a grizzled gray-haired man. ''They're talking winds twenty to twenty-five out of the north by noon,'' Ray adds. ''I'd as soon hang in here today then. They're calling for lighter winds tomorrow,'' suggests Jim. Jim immediately pulls the cockpit cushions aside and lifts up the lazarette. In seconds he's immersed in a project. Morning, along with the tangy scent of autumn and pine tickles my nose and stirs memories of our previous falls, until now, spent on the Chesapeake. Since the cockpit is for the moment impassable. I set the mug down and follow my thoughts. The summer season ebbed slowly as we segued into the fall. 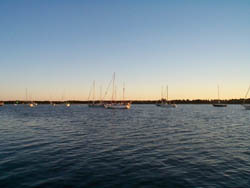 Weekends brimming with good wind to revisit our favorite anchorages and drop the hook for the season's final raft-ups offered sweaters and brandies in the cockpit as we savored the cool of evening after the dog days of August. Jim and I looked forward to the costumed Halloween party at Great Oak Marina and pizza with movies (always involving boats e.g. ''Dead Calm, Midnight Crossing and Captain Ron) aboard Lou and Cindy's, Refuge. There were savory pots of chili spooned into Sue's hand crafted pottery bowls aboard Insatiable. Winterizing the boats became a group effort whose compensation would be planning our annual winter get-together at Tilghman Island. So many familiar little observances we shared together, including them in our lives gives it shape and substance. I notice the day is warming up. I wonder about the weather up north then pull my sweatshirt over my head. It's the weekend. Surely, I'd be wearing sweaters by now if I were there. I'm not. We are in North Carolina, a few hundred miles from the Chesapeake. New events are shared on boats with different names. Jim and I would need to choose a new set of observances. I heard myself sigh. But right now I had things to do. And a practical observance came first. I learned quickly; I always had laundry. The enjoyment of any down day became enhanced by the addition of clean clothes. It's funny how good I always feel with an empty laundry bag. In addition, the laundry room provides serious social opportunity as well as new reading material. Women bond quickly folding shirts and underwear. As illustration, leaning over the dryers at Midway Marina I snagged an invitation to dinner that night from Alice aboard Cut'em. I also picked up a Mary Higgins Clark novel I hadn't read. And I'd never had Brunswick Stew. After Jim checked the engine and reviewed charts while I put away the laundry and tidy up the saloon we stroll the docks actually meeting the woman, Lynn and her husband, Tom aboard the Hunter 45, Tomlin Two, into whose ports I'd been peeping the previous morning in Norfolk. We discovered we planned a mutual destination in the Bahamas but since Tom's consulting duties necessitated his leaving the boat periodically their trip would be interrupted and take longer. Jim and I promised to keep in touch. No immediate response from Jim; he's headed up the front steps. I lag behind absorbing the quiet and the scene. Wooden docks abut the shoreline and straight angle into a small canal where the Damn Yankee lays secured. A fenced pool, now deserted, lays surrounded by a grassy lawn. Tall pines rim the marina's perimeter. And there is always the water coursing past; its dusky terra cotta suggests a deceiving sluggishness as the current runs swift at two to three knots. I stood alone on the dock for a long minute just observing before turning to catch Jim. I leap the steps two at a time. Jim is already inside inspecting buckets. But, I have to pause a moment. At the door a cleverly crafted life size witch bearing the requisite pointed toes, nose and hat is propped in a rocking chair. I shoot her a wide smile, give her soft shoulder a quick pat. She is a good omen. After all, I was born and grew up in Salem, Mass. The Damn Yankee flies my very own witch flag. I like Midway Marina. It possesses an easy comfortable feel fostered by its owner, Terry Miles. Sure enough, he's waiting inside with my second hug of the day and a ready laugh. 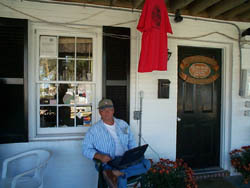 I'm staring with apprehension at the large array of tee shirts touting an ''I survived Albermarle Sound'' motif. What were they saying? What did it mean? I'd listened as the men discussed the vagaries of the Albermarle. How bad could it be? Evidently worse than I'd envisioned if they had tee shirts heralding its ominous reputation. Yet another reason to be grateful for the day's reprieve. I arched my brows as I held his gaze for seconds then abruptly turned away. ''I might buy one myself,'' he teased. I pretended to be engrossed in the wines. Surprisingly, Midway stocks a variety of good wines, cabernet and chardonnay with familiar labels. I was seriously considering at least two; one before crossing Albermarle and one for during the crossing. With any luck I'd be unconscious when we crossed into the Alligator River. Better sense prevailed. The Damn Yankee's exhaust was nearly underwater now with the crates of wine we'd stocked and we were still working on the bargain case of red we purchased in Norfolk. I was also becoming more familiar with my ''crew'' duties. Jim would need me sober and agile. So, I passed up the wine and the tee shirt although Jim did purchase that new bucket along with a three pound tin of cashews to snack on during the run. I wondered if cashews carried any anesthetizing qualities? Crossing morning, Jim and I headed away from Midway Marina Saturday by eight after taking on fuel. Alaina, who manned the store and I had our last book discussion and after a quick hug she waved us off with a directive and a declaration. I tried not to fixate on the ''be safe,'' as we headed down the North Carolina Cut through the North River extension to enter Albermarle Sound. I was considerably calmer after motoring the nearly fifteen mile approach. The tightness in my stomach eased while viewing a densely wooded shoreline interspersed with clapboard bungalows. Washing hung from clotheslines. A few people waved from their yards. I waved back. We could have been traveling through an earlier time. We were certainly in another place. I had not anticipated the completeness of the silence. I sensed change here happened slowly. Then, we were in the Sound. At mile marker sixty-five beyond Camden Point I felt the familiar churning gazing ahead at a liquid vista whose span caused my breath to catch. I stood within the confines of the cockpit dodger and peer ahead trying to gauge the distance. I could not. Within an hour the sound and vibration as the engine reverberated pushing us over the water offered a reassuring calm. It's not so bad. I finally relaxed as the Damn Yankee bounced over the light chop. Maybe I should have bought that tee shirt after all. ''Sure.'' I slide around to take the wheel while Jim moves forward to the bow to release the sheets running them back to the cockpit. A turn or two around the wenches and twenty seconds of pulling as the head-sail unfurls sets the Damn Yankee on a broad reach across the sound. 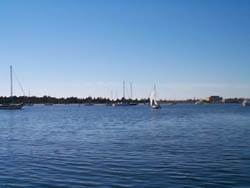 The wind peaks at fifteen knots. We were running with it. I close my eyes to breath deep savoring the feel of the wind against my face. We were having a great Saturday sail albeit very far from our familiar sailing grounds. Our first sound seemed to be cooperating beyond our hopes. Jim's hands rest lightly on the wheel an expression of pure contentment lights his face. Jim and I would survive Albermarle Sound. Only a fifteen minute rain shower within sight of the Alligator River sent me below in search of our foul weather jackets. We glide past another sail boat close enough to wave and exchange greetings. I watched us close in on the Little Alligator River eventually passing Long Shoal and Sandy Points to reach the anchorage by four-thirty that afternoon. Jim and I dropped anchor five hundred feet off a wooded shoreline. Casa Blanca and Cut'Em lay off to starboard. Ray beckoned with a yell and a wave. Jim and I hoisted the dinghy over the side and rowed over for dinner in Casa Blanca's cockpit. Bringing a bottle of white, a bottle of red, we were starved and ready to review the day's events. Perfectly grilled steaks with all the accompaniments, sipping good wine enjoying good company we almost missed the change in the wind. We all jump. We need to row back to the Damn Yankee. Aboard Cut'Em, Jimmy and Alice untie their lines from Casa Blanca and head off to anchor. We'd all departed within minutes. But we barely climbed aboard in Jim's and my case or set the anchor in the case of Jimmy and Alice before a full squall complete with drenching rain and howling wind descended with full fury. My little joke falls flat. Jim merely nods. Concern etches his features. I realize we could have had a serious problem. ''We got back. We're safe. I'll know better next time and follow my instincts.'' Jim offers a weak smile. He's worked it through. We will know better next time. Crawling into the v-berth with wet hair, I concluded the number of unexpected events we would encounter almost daily would keep us on our toes. I couldn't decide if my observation warranted a smile or a grimace. But, I had enjoyed the dinner and the company. I think I was smiling as I drifted off to sleep. So began our ICW odyssey. The prevailing measurements of time and condition gradually dissipated to be replaced by the fluctuations of the barometer and the ongoing tally of miles. The distance lengthened. We pressed on. The sight of Dowry Creek Marina in Belhaven, N.C. at mile marker 132 tendered a glimpse of antebellum in the square white painted three-storied structure with porches on three sides. From a mile off I almost expected to hear cannon fire. But the female dock master in khaki shorts who helped us tie up jerked me back to the present until a trip to town for dinner supplies sent me past my first sight of growing cotton. Immediately recognizable, the crop looked exactly as I had imagined. The ageless quality of the field set my imagination swirling. I could almost see streaks of gray and hear the clip-clop of horses through the woodland beyond the field. I had no time to linger there. Jim and I were having dinner guests. ''One package didn't look like enough in the store,'' I mumbled eyeing the heap of chicken in the sink. ''Jeeze, it will take an hour to bone all this!'' Jim's voice rose. Since he held the boning knife I remained mute and let him rant. I recognized his point. I'd bought far too much and the freezer was full. We'd be eating on board now, I thought. We began that night. The herbed stuffed chicken was a success. The men asked for seconds. We remained squall free for the evening. Jim was finally smiling. There were no leftovers. The boning knife lay in the drawer. Luminous candlelight filled the saloon. New faces, new stories, it felt good to entertain friends in our home. I discovered that Ray White was an amateur historian as well as a cranial surgeon with even a book to his credit. His wife, Betty's soft drawl kept me enthralled. One of the south's ''steel magnolias'', I could see her holding off the Yankees with only the tone of her voice. Jim's inquiries on destinations, tidal change and currents along with mine on battles and Civil War generals were answered with experienced and studied clarity by both Ray and Betty. Clint Eastwood crossed with Jimmy Stewart, Ray's sharp intelligence and reflective manner continued to reinforce our confidence in the scope of his knowledge. Knowledge he willingly shared with us. Suddenly, the daunting prospect of unfamiliar travel and unaccustomed isolation dims. I was ready to head out in the morning. Out into the Pungo River by 7:00am, entering the Pamlico River at mid-morning then watching for the land cut entrance at Goose Creek, we head for Green Lighted Marker #1. The land cuts always offered me a sense of safety. With each bank nearly equidistant, I'd simply drift with the current feeling a bit Tom Sawyerish letting the scene unwind in frames of wild timberline. Green loblolly pine tree trunks reach skyward clogged between with red sweet gum leaves. The golden yellow marsh grass inches to the high side of the waters' edge. Beyond Maw Point, the land cut and lunch behind us we motored down the Neuse River. ''Just ahead,'' Jim pointed forward. Two sleek silver bodies carved the surface swimming in tandem for seconds before they arched their bodies, diving beneath the water. Surfacing off the port side, they joined us. The Damn Yankee and the dolphins traveled for some miles together. They lead; we followed in their wake. Jim and I were both grinning as we pulled into a slip at Oriental Marina. Afternoon sun warmed our shoulders. ''Of course,'' I answer swinging my legs over the lifeline and jumping onto the finger pier. ''Gwenie, Alice and I are going across the street to shop. Want to come?'' Betty calls from the dock pointing across the street. The large Victorian style house looks lovely painted variegated shades of tan. A rocking chair beckons. The huge baskets filled to overflowing with ''stuff'' lures. It's a no-brainer. I leave with Betty and Alice. The men join us a few minutes later because they only had to cross a two-lane street. We browse through rooms filled with the requisite tee shirts but there were shoes, jewelry, linens and more. Bypassing the jewelry case, Jim found and bought me the biggest canvas bag for laundry I'd ever seen. I told myself, it's the thought that counts. His thought was well transmitted by his self-satisfied expression. I shot him a look and swept out the door, the laundry bag swinging off my shoulder. Oriental, N.C drops you into the movie set of ''Forrest Gump'' in the best sense of the word. Time tracks decades behind. So many friendly people, sure of themselves and their place, it's we who are the outsiders. Yet, they indulge us. Some would call Oriental a map dot; yet I would have enjoyed another day there. It is Halloween morning and it is freezing. How could that be? I'd worn shorts yesterday. The chamois dripped from my numb fingers. The isinglass streaked. The sun was barely up. The Damn Yankee's lines were stiff from the night's chill. But the engine hummed as we pulled out of the slip. My old gray sweats offered some comfort except where the port side bumper left a cold wet trail from thigh to knee as I hauled it up. Telling myself I would be dry by noon, I wrapped my frozen fingers around my cooling cup of coffee. Shrimp boats shrouded in netting like old dowagers lay resting at the docks. Feeble streaks of sunlight pierced the cloud cover. It was too early to be this cold. Beaufort, N.C. (pronounced Bo-fort) was our destination. I'm reading as we wind our way through Adams Creek. I'm confused. I continue rereading past the more than five miles of Adams Creek Canal. I'm still confused. Scanning ahead with the binoculars, I'm lining up the range markers to begin our approach into Russell Slough Channel. It looks as though there is more than one channel. The markers seem to intercept. We slipped past Red and Green markers 28 and 29. I must have been reading from the handbook out loud because we veered a few degrees starboard instead of straight ahead and found ourselves in the old Gallant Channel into Beaufort. Jim focused on crabbing down a seriously shoaled channel. Even with the tide up the depth gauge screamed its warning for each inch gained, loudly blazoning our blunder to all vessels within earshot. The opening delay for emergency vehicles to pass at the Route 70 Highway Bridge as Jim swung the boat in concentric circles within the narrow channel only upped his irascibility factor. I could read his frustration in the set of his jaw and the tightness of his hands on the wheel. Yet, the Damn Yankee moved in slow graceful circles until the bridge opened and we swept through. Jim's relief was nearly audible. The swift flowing water pulls us past two other slips. One slip left before we'd have to head out and come back in again. ''Go ahead now. Just power her in, Capt,'' yells the dockhand. Instead, Jim eases off the throttle using the current to line up the slip and with a quick turn of the wheel we are nosing into the slip past the first pilings. I'm ready. Frozen hands thawed sufficiently, my line spirals in perfect precision uncoiling over the dock, slowly dropping… to snake around the dockhand's neck. We'd arrived. And with nary a scratch on the Damn Yankee's hull. I grinned at the dockhand. It was a great toss. It is noon. All we had to do was lunch. Or so I thought; a chafed fitting in the engine's cooling system kept Jim busy for three days. Another serious potential problem averted by daily engine inspections. We would happily delay lunch. The temperature dropped. I found myself handing over my credit card for the purchase of a heavy sweater and two pairs of wool socks. Leaving the store clutching my bag, I imagined warm feet the next morning. Where was this warm weather Jim promised me? It was obviously late fall in Beaufort. What was not obvious to me was north or south, cold is cold. Three days spent in Beaufort, N.C. to wander the docks marveling at the profusion of boats from pedigreed yachts captained by men in starched white to sloops of dubious lineage skippered by sea dogs in wrinkled khaki proclaims Beaufort a sailors town. For three days the song, ''Mandy,'' by Looking Glass kept replaying through my mind. 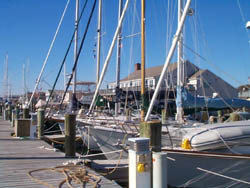 Taverns line the wooden docks. The sailors come in from the sea. And they will leave again. I could easily fancy the auburn haired woman behind the bar laying whiskey in front of a bearded mariner the lyrics' protagonists. Just behind the taverns the town stretches parallel to the water, one lengthy street showing a continuity of mellow brick and white frame homes. The lyric, ''she walks through a silent town,'' drifts through my mind as Jim and I walk back to the boat that night. ''Mandy'' could have walked these streets. We say a reluctant ''good-bye'' to Casa Blanca and Cut'Em with hugs all around. They are on a schedule and we will be delayed another day while Jim finishes up with the engine. I hoped we would see them again. ''Are you sure?'' I ask. ''That's fine with me.'' I try not to sound too excited. Our last night here, I'd enjoy the nautical ambiance a tavern provided. I could sip a beer, people watch and over-stimulate my imagination. What fun! In less than forty-five minutes we were seated at the bar with beers in front of us. Jim glanced around and smiled for the first time that day. Everywhere there are sailors. Jim had already struck up a conversation with the gentleman next to him wearing a Harken hat. Whether permanent or temporary residents all surrounding us have answered the sea's siren call. You can read the summons on leathery wind burned faces. You recognize the bent knees and the slight list in a gait. Ports of call are no longer recognizable by a vessel's name. The days of small ships plying trade up and down the coast are largely forgotten. Sailors today wear ports of call embossed on tee shirts emblazoned with Nantucket, Newport, Montauk, Mystic on to Beaufort, Charleston, Savannah and Key West. Only the language remains. Bar talk consists largely of all things nautical. Epoxy resins to varnishes, the merits of haul-outs or prop replacements, the durability of canvas and line, the force of tide and current in planning inlet approaches are better analyzed over a cold one. Consensus arrives with the next round as the discussion continues. Attendant within a wood framed waterfront structure time-honored tradition prevails. Dusky light paints the figures bellied up to the bar in muted color. The scent of whiskey and hops mingle with the musty scent of stagnant water. The taste of grease and tobacco hangs in the air. I lift my mug, take a long pull on my beer savoring its green aftertaste then set it down with resounding crack. No one notices over the pitch of voices and the din of rock. I lift my mug in a silent toast. The romance of the seafarers lives on. Morning would have The Damn Yankee slipping her lines once again. I said a silent prayer the current would be slack. Jim and I would be on our own again. Tomorrow, we would definitely eat on board. I would pull out the rest of the chicken. I swallowed my beer and smiled.